H.I.S. International Group of New York is recalling about 4,400 girl’s clothing sets with a pendant necklace. This recall involves Self-Esteem brand girl’s clothing sets with a gold leaf pendant necklace. 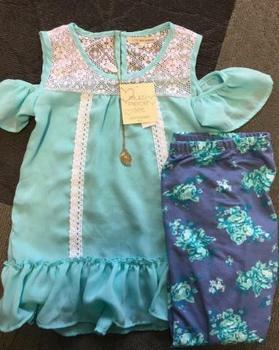 The recalled clothing sets consists of three items: a short-sleeve teal top with cut-out shoulders, a navy blue legging pant with a teal floral print and a pendant necklace with an orange and teal center. The recalled clothing sets have style number PO#71160/LOT9 and a date of production of 10/2017 printed on a white label on the inside of the garment. The recalled product was sold in girl’s sizes 4x-12x. The clothing sets, manufactured in China, were sold at Burlington and Shopko stores nationwide from February 2018, through October 2018, for about $14. Consumers may contact H.I.S. At (800) 451-0285 extension 2879 from 9 a.m. to 5 p.m. (ET) Monday through Friday, by email at address-info@his-nyc.com or online at www.his-nyc.com for more information.